I began following this blog during the #AtoZ Challenge and it is well worth the time! This amazing post will reach a few more lucky folks as I reblog it. Thanks to Maryann Holloway. This April 1989 file photo shows American Thoroughbred Secretariat at the Claiborne Farm in Paris, Ky., in April 1989. Two days ago, the Belmont Stakes, the third leg in the Triple Crown of horse racing was held and the results were that we didn’t have a new Triple Crown winner. Hats off anyway to California Chrome for winning the first two parts of the Triple Crown. There have been 11 Triple Crown winners in history. 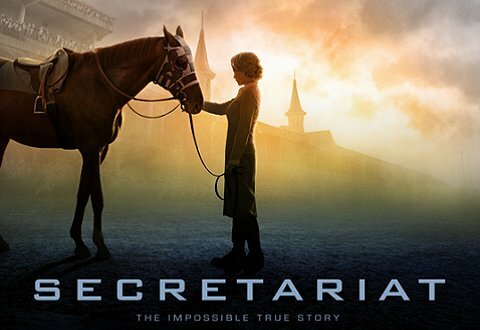 The famous story of Secretariat captured our hearts in the 2010 Disney film. This entry was posted in A Few of My Favorite Things. Bookmark the permalink. Honestly Maryann, this post is a great gift. I graduated from the University of Kentucky where I learned to read a racing form and arranged Spring classes so Thursday afternoons were free to go to Keenland Race track for the Spring meet. I have shared your post on my personal Facebook page and have rebloged it on Stephenyhoughtlin.com I hope it brings new followers to you Many thanks for the incredible work you do to create something like this Triple Crown information. Liked this post a lot. I think as long as owners continue to enter horses in the Belmont that don’t race in the previous two legs of the Triple Crown and are thus rested, we are unlikely to get another Triple Crown winner. Secretariat was magnificent. Thank you so much for the reblog and I also liked that you had a Kentucky reference to horse racing. That must have been interesting times.